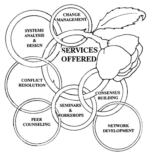 The general focus of the work of the Community Network is the development of cooperative working relationships within individual organizations, and across organizational and political boundaries. Our overall goal is the development of programs, services, and organizations that are socially, economically, and ecologically sound. The Dry Creek Valley Association is a charitable 501c(3) organization whose mission is to protect and enhance the natural resources, rural aspects and agricultural heritage of the Dry Creek Valley and its watershed, while safeguarding the interests of the valley’s present and future community. Farm to Pantry is a community of volunteers dedicated to providing fresh, healthy and affordable food to everyone. We live and glean in Sonoma County, California, where there is a growing community of farmers, gardeners, and residents dedicated to ensuring fresh and healthy food for everyone.